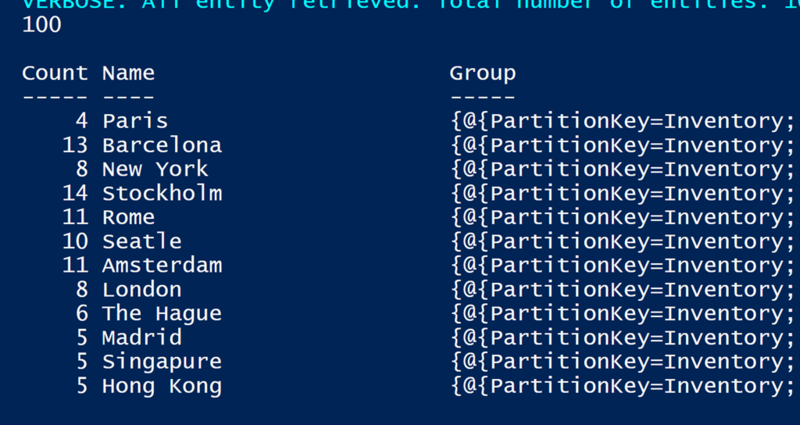 Today’s mission was to get more familiar with Azure Storage Tables and to manage them with PowerShell. On GitHub I found the AzureTableEntity module from Tao Yang. Below are a number of code snippets I used to get my hands dirty with Azure Storage tables and the module. We will need the Storage Account key later so let’s get that one as well. Now that we have the table created, we can start adding data to it, let’s start with adding just one row first. $querystring = "(PartitionKey eq 'Inventory')"
Next let’s add some more data to it, the below code creates some random computer inventory data. If all went fine, we should now have all the data in the table. $querystring = "(ComputerName eq 'Computer000001')"
Let’s retrieve the record again. and there we go, it’s now registered in Rotterdam. Let’s query the entire database again. I query the information again, as i will re-use the return values to build the remove properties. If you followed my example, you should now have 99 rows left. I hope you enjoyed this blog post, as always comments and feedback are welcome.